When winter arrives in the Adirondacks, many bodies of water freeze over, making them prime spots for ice fishing. If you've never been ice fishing in the Adirondacks before and would like to start, then check out our ice fishing tips below to help you prepare. Adirondack ice fishermen can expect to catch a variety of fish species, such as perch, sunfish, pickerel, northern pike, and walleye. Depending on the area and regulations, some waters allow lake trout and landlocked salmon fishing. Any skilled fisherman can transfer their knowledge to ice fishing, but a great deal of preparation and research is still necessary. The best way to learn the basics of ice fishing is to tag along with an experienced ice fisherman. If you're interested in planning a fishing trip, then the first step is to check the weather. Try to choose a mild, less windy day unless you're willing to brave the more extreme Adirondack winter temperatures - and have the proper gear to do so. Always check the ice thickness before planning your trip. 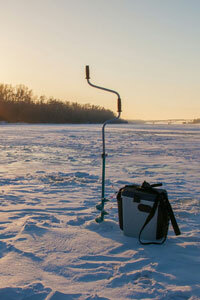 Tackle shops in local communities are likely to have the inside scoop on nearby ice conditions. There are quite a few different ice cutting tools to choose from, each with a different advantage. Keep your tools properly maintained, and they will last a long time. Always dry auger blades after returning home and apply a thin coat of oil to prevent rusting. Keep the blade safety on to avoid accidental cuts. These old-school tools are fairly cheap and work on ice up to a foot thick. Spud bars are chisels, usually over 6 feet long, made of iron or steel, with jagged teeth. Many fishermen carry them in addition to manual augers because they can easily jab ice to test its thickness, strength, and safety. Slightly more expensive than spud bars, manual augers cut through the ice faster than spud bars and involve less manpower. The diameter of the auger chosen should depend on the size of the fish you hope to catch. The bigger the auger, the more ice that must be removed, so avoid overexerting yourself and stick to what you need. The most expensive option, a gas-powered auger is the best choice for dedicated anglers seeking speed and convenience. They are heavy and not as easily transported, but they can cut through extremely thick ice. Gas augers can be less reliable than a manual auger (just like your gas lawnmower), but mechanical failures aside, a typical gas auger will cut through ice like butter. Once you've planned your trip based on weather and ice conditions, you'll need the proper gear. It seems obvious, but always remember to dress warm with special attention to head, feet, and hands. You'll want to dress in layers so that you can cool off when you exert yourself cutting a hole in the ice. Ice cleats or traction devices for your winter boots are always a plus, and they will keep you from taking a spill on the ice. Always bring a spare set of clothing and more than two pairs of socks and gloves. For extreme Adirondack weather or extended trips, an ice shelter or shanty is an ideal solution. 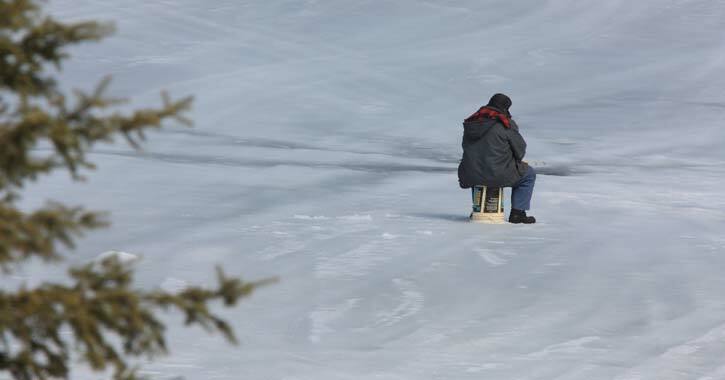 For day trips, a simple outdoor chair, or a chair made specifically for ice fishing might be a smart purchase - and you'll avoid sitting on your cooler. Heaters and cooking devices are also wise choices depending on the length of your trip. Ice line is a necessity for fishing in the incredibly clear winter waters. Ice line has a high water repellency, less stretch, and ultra sensitive feeling so even cold hands can sense a bite. Ice lines are also designed to have a refractive index close to the water so fish are less likely to see it. The tackle you choose will be based on the type of fish you hope to catch. Many Adirondack ice fishermen practice the art of jigging. A jig is a type of lure that consists of a sinker with a hook molded into it, creating a jerky vertical motion. The jig keeps the bait moving, so fish are more interested in taking a bite. Some fishermen switch from horizontal jigs to vertical jigs or try twisting the line rather than jumping it up and down to vary the appearance of the jig. A tip-up device, usually a red flag, will let you know when a fish has taken the bait. Tip-ups are generally rigged with live bait (shiners, suckers, fatheads and other baitfish). The bait is set at specific depth depending on what body of water you are fishing, and what species of fish you are after. The flag on the tip-up is rigged to the reel, so that when a fish strikes the bait the flag goes up to signal the fisherman to try to set the hook and pull the line in by hand. In New York State, angling regulations limit fishers to five tip-ups. The fisherman must be in immediate attendance when the lines are in the water, and tip-ups must be marked with the owner's name and address. 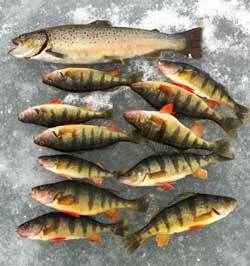 Cold weather safety and ice thickness are two important factors in ice fishing safety. While most Adirondack outdoorsmen know the proper methods to avoid hypothermia, ice safety can elude even the most experienced fisherman. Always ice fish with a buddy and let loved ones know of your exact location whenever possible. Have a safety plan and emergency kit, including thermal blankets, on hand as well. A spare set of warm clothes and socks will go a long way. Ice thickness is never uniform on any body of water, making it hard to judge the safety of the area. Running water, including the areas of lakes where streams, spillways, and dams are present, are often tricky spots. If you keep in mind that ice will never be completely safe, you'll be prepared for suddenly dangerous situations. Below we've put together some ice thickness guidelines. The number of inches are minimums, so for example, 8 inches is the minimum ice thickness before a driver should consider driving on the ice. Mottled/Slushy: Thawing ice - stay off! Light Gray/Black: Melting ice - stay off! **Guide based on clear, blue, hard ice on non-running water. Slush ice has half the strength of blue ice. River ice is 15% weaker than non-moving ice. If the ice is thick enough for vehicle parking, move your car or pickup every 2 hours to prevent sinking. Make a hole near your car to monitor the ice. If water begins to overflow from the hole, your car has begun to sink the ice and you should move it immediately. Park all vehicles at least 50 feet apart. Repeated parking in a fishing "hotspot" will cause the ice to weaken. Avoid parking where it seems another vehicle has parked or driven. When possible, avoid driving or parking on ice altogether. Keep in mind that there are regulations as to how many, and what size fish of each species can be taken in a given day, and these rules vary depending on the body of water you are fishing from. You must have your current year's fishing license. When you obtain your NYS fishing license, you will receive a Fish & Game booklet that contains all rules and regulations. You are responsible for knowing all regulations for the body of water that you are fishing from.